Some of the magazine’s articles eventually get posted as free reads – no way of knowing if this article will be one of them. 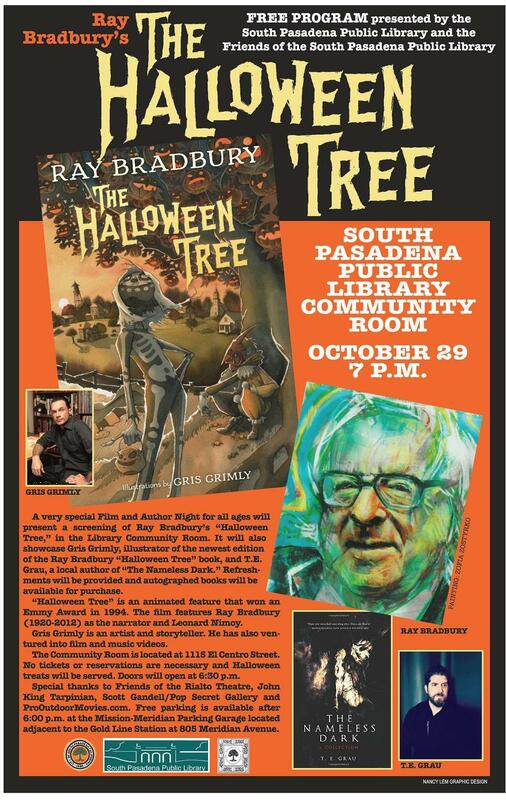 (2) Ray Bradbury’s Halloween Tree screens at the South Pasadena Public Library on October 29. On Thursday, October 29 at 7 p.m. a very special Film and Author Night for all ages will present a screening of Ray Bradbury’s “Halloween Tree,” in the Library Community Room. It will also showcase Gris Grimly, a “mad creator” and illustrator of the newest edition of the Ray Bradbury “Halloween Tree” book, and T.E. Grau, a local author whose new book of spooky stories, “The Nameless Dark” was recently published. Refreshments will be provided and autographed books will be available for purchase. A brief introduction to the film, with insider insights to the genesis of the film, will be offered by Robert Kerr of the Ray Bradbury Pandemonium Theatre Company. Robert was with Ray Bradbury during his last four Halloweens on earth. The free program is presented by the South Pasadena Public Library and the Friends of the South Pasadena Public Library. (4) Here is a piece of Bradbury-related Halloween trivia bordering on the obscure. In the opening number of the Rocky Picture Horror Show, “Science Fiction – Double Feature,” sf movies are mentioned. One is It Came from Outer Space, which was based on Ray’s story. The films referenced in the opening number, “Science Fiction, Double Feature,” are: The Day the Earth Stood Still (1951), Flash Gordon (multi-film franchise), The Invisible Man (1933), King Kong (1933), It Came from Outer Space (1953), Doctor X (1932), Forbidden Planet (1956), Tarantula (1955), The Day of the Triffids (1963), Curse of the Demon (1957), and When Worlds Collide (1951). This entry was posted in Heard Online and tagged Ray Bradbury by Mike Glyer. Bookmark the permalink. I am starting to get the notion that Our Gracious Host may be a fan of Ray Bradbury. More data is required. I will take credit or blame for the Ray oriented stuff. Definitely credit, yes. I’ve never commented on the Bradbury scrolls because of nothing to add, but then, thanks is a thing, right? that should be added, yes. I haven’t been to Rocky since the1980’s, but I remember we groupies used to spend nights tracking down those references, and arguing about the relative merits of each.